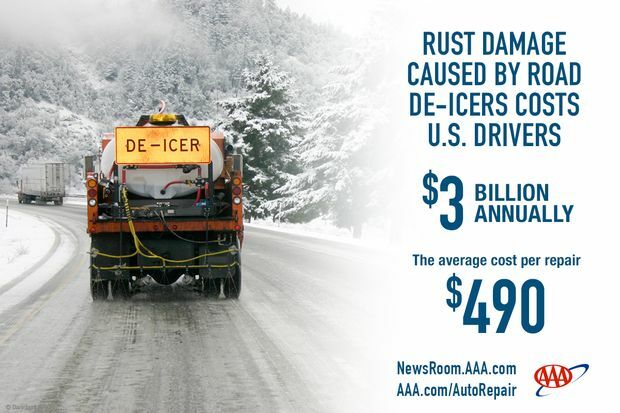 According to a new AAA survey, U.S. drivers paid an estimated $15.4 billion in rust repairs caused by de-icing methods over the last five years, or approximately $3 billion annually. As the end of winter approaches, New Englanders will face pricey vehicle repairs from rust damage caused by chemicals used to de-ice roadways. AAA advises drivers to take action to prevent dangerous rust-related vehicle damage to brake lines, fuel tanks, exhaust systems and other critical vehicle components. View AAA Northern New England Auto Technician’s video clip. In recent years, some state and local transportation departments have shifted from using rock salt to liquid de-icers to combat ice and snow on the roadways. These newer alternatives are more effective than traditional salt because they can be applied before a snowstorm, have a lower freezing point and melt ice and snow faster. However, these same characteristics can be even more damaging to vehicles since the chemicals remain in liquid form longer and are more likely to coat components and seep into cracks and crevices where corrosion can accelerate. In 2010 The University of Maine released a report titled, Maine Winter Roads: Salt, Safety, Environment and Cost that outlined the use of salts on winter roads in Maine and the consequences of that use. Get the bottom of your vehicle undercoated. It helps prevent moisture and compounds from getting into exposed areas and is designed to keep your vehicle’s undercarriage safe from rust and corrosion.